Sredni Vashtar was published in Saki's book, Chronicles of Clovis in 1911. It is featured in our collection of Halloween Stories. Conradin was ten years old, and the doctor had pronounced his professional opinion that the boy would not live another five years. The doctor was silky and effete, and counted for little, but his opinion was endorsed by Mrs. De Ropp, who counted for nearly everything. Mrs. De Ropp was Conradin's cousin and guardian, and in his eyes she represented those three-fifths of the world that are necessary and disagreeable and real; the other two-fifths, in perpetual antagonism to the foregoing, were summed up in himself and his imagination. One of these days Conradin supposed he would succumb to the mastering pressure of wearisome necessary things---such as illnesses and coddling restrictions and drawn-out dullness. Without his imagination, which was rampant under the spur of loneliness, he would have succumbed long ago. Mrs. De Ropp would never, in her honestest moments, have confessed to herself that she disliked Conradin, though she might have been dimly aware that thwarting him "for his good" was a duty which she did not find particularly irksome. Conradin hated her with a desperate sincerity which he was perfectly able to mask. Such few pleasures as he could contrive for himself gained an added relish from the likelihood that they would be displeasing to his guardian, and from the realm of his imagination she was locked out---an unclean thing, which should find no entrance. And then of a sudden he stopped his chanting and drew closer to the window-pane. The door of the shed still stood ajar as it had been left, and the minutes were slipping by. They were long minutes, but they slipped by nevertheless. He watched the starlings running and flying in little parties across the lawn; he counted them over and over again, with one eye always on that swinging door. A sour-faced maid came in to lay the table for tea, and still Conradin stood and waited and watched. Hope had crept by inches into his heart, and now a look of triumph began to blaze in his eyes that had only known the wistful patience of defeat. Under his breath, with a furtive exultation, he began once again the pan of victory and devastation. And presently his eyes were rewarded: out through that doorway came a long, low, yellow-and-brown beast, with eyes a-blink at the waning daylight, and dark wet stains around the fur of jaws and throat. Conradin dropped on his knees. 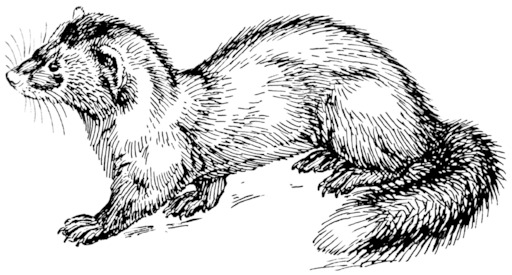 The great polecat-ferret made its way down to a small brook at the foot of the garden, drank for a moment, then crossed a little plank bridge and was lost to sight in the bushes. Such was the passing of Sredni Vashtar. Add Sredni Vashtar to your own personal library.